In the first quarter of 2017, the dip in the ringgit’s performance against other currencies was stabilised after Bank Negara Malaysia (BNM), the central bank of Malaysia, took measures to clamp down on the derivative and hedging market at the end of 2016. The BNM stated that this financial intermediation was intended to be supportive of growth, supported by strong bank balance sheets and a well-developed financial market.5 However, by the fourth quarter of 2017, the ringgit continued to appreciate against the US dollar and most regional currencies. The five main local banking groups are Malayan Banking (Maybank), Public Bank, CIMB Bank, RHB Capital and Hong Leong Bank. All have widespread branch networks, affording them access to inexpensive funding sourced from retail deposits. All have affiliated Islamic and investment-bank subsidiaries. In line with the FSB, the regulatory and supervisory framework of Malaysia in respect of the banking and finance sector was recently consolidated and updated under the Financial Services Act 2013 (FSA) and the Islamic Financial Services Act 2013 (IFSA) (collectively, Acts), both of which came into force on 30 June 2013, simultaneously consolidating and repealing the Banking and Financial Institutions Act 1989 (BAFIA), the Insurance Act 1996, the Payment Systems Act 2003 and the Exchange Control Act 1953. The Acts aim to provide a regulatory framework for both the conventional financial and shariah-compliant sectors, and endow the BNM with greater powers to counter future risks to stability in the financial sector, increase consumer protection and promote competition in the financial services sector. The Acts also contain provisions that preserve every guideline, direction, circular or notice previously issued under any repealed legislation in relation to any provision of the Acts prior to their coming into force. Malaysia has also established its own mid-shore jurisdiction on the island of Labuan, off the coast of Borneo, which was declared an international offshore financial centre in October 1990 to complement the activities of the domestic financial market in Kuala Lumpur. Labuan is regulated and administered by the Labuan Financial Services Authority (Labuan FSA) pursuant to the Labuan Financial Services Authority Act 1996 (Labuan FSA Act). In 2008, the jurisdiction was renamed the Labuan International Business and Financial Centre (Labuan IBFC), and an entity called Labuan IBFC Incorporated was established as the jurisdictions marketing arm in 2008. The Labuan FSA and the Labuan IBFC work together to promote Labuan IBFC’s reputation as the premier mid-shore international business and financial centre in the Asia region. Entities operating in the Labuan IBFC are subject to federal laws that are specific to the Labuan IBFC. Labuan banks are subject to the Labuan Financial Services and Securities Act 2010 (LFSSA) and Labuan Islamic banks are regulated under the Labuan Islamic Financial Services and Securities Act 2010 (LIFSSA). The BNM is a statutory body wholly owned by the government that was established under the Central Bank of Malaysia Act 1958 and continues to operate under the Central Bank of Malaysia Act 2009 (CBA), which became effective on 25 November 2009. The BNM reports to the Minister of Finance (Minister) and keeps the Minister informed of policies governing the monetary and financial sector. The BNM is empowered to act as the regulator of banking institutions under the Acts and the CBA. The CBA confers the necessary powers and instruments on the BNM to achieve its mandates effectively, and legitimises the duality of both the conventional and the Islamic financial systems in Malaysia, and in doing so establishes the legal foundation for development of an Islamic financial system within the Malaysian financial system. The BNM’s primary objectives include the prudent conduct of monetary policy, financial system stability, and the development of a sound and progressive financial sector. In carrying out the aforementioned, the BNM is responsible for advising the government on macroeconomic policies and the management of public debt. It is also the sole authority for issuing currency and managing the international currency reserves of the country. Other functions of the BNM include the regulation and supervision of financial institutions as described below, and the monitoring and supervision of payment systems, money markets and foreign exchange markets. From a supervisory perspective, the BNM is empowered by the Acts to regulate banking institutions, and does so by way of a risk-based supervisory (RBS) approach that monitors and reviews the manner in which all financial institutions identify, control and deal with their respective business risks. In addition to the foregoing, financial institutions and investment banks that provide capital markets services are regulated by the Securities Commission (SC), a statutory body with investigative and enforcement powers established under the Securities Commission Act 1993 (SCA). The SC is the regulatory body mandated to regulate the Malaysian capital market, and is directly responsible for the regulation, supervision and monitoring of all persons licensed under the Capital Markets and Services Act 2007 (CMSA) with the core objective of investor protection. The SC is also primarily responsible under the CMSA for encouraging and promoting the development of the securities and derivatives markets, and for the monitoring and supervision of public-listed companies to ensure compliance with securities laws. The CMSA constitutes a single framework regulating the offering and licensing of capital market services, market conduct, issuances of securities and the conduct of takeovers and mergers. Debt issuances (bond and sukuk) in Malaysia require the approval of the SC, and are further governed by various guidelines and practice notes issued by the SC under the CMSA. The Labuan FSA is the sole statutory body responsible for the regulation, supervision and development of the Labuan IBFC under the Labuan FSA Act. According to the Labuan FSA website, the objectives of the Labuan FSA include (1) promoting and developing Labuan as an international centre for business and financial services; (2) implementing national objectives, policies and priorities for the development and administration of international business and financial services in Labuan; and (3) acting as the central regulatory, supervisory and enforcement authority of the international business and financial services industry in Labuan. The foregoing includes the licensing and regulation of licensed entities operating within the Labuan IBFC, and supervision over those entities to ensure their compliance with the applicable domestic and international standards and best practices. The Development Financial Institutions Act 2002 (DFIA) provides for the BNM to be responsible for the regulation and supervision of specialised financial institutions known as ‘development financial institutions’ (DFIs), established by the government to specifically develop and promote national strategically important socioeconomic sectors such as agriculture, small and medium-sized enterprises, infrastructure, maritime, export-oriented sectors, capital-intensive and high-technology industries. The provisions of the DFIA empower the BNM to monitor the activities and financial performance of these institutions and their main objective, which is to provide specific financial products and services to cater to their respective focus areas; and to ensure that DFIs are resilient, efficient and able to fulfil their respective mandates in a financially sustainable manner, while contributing to the overall stability of the financial system. In January 2016, further amendments were made to strengthen the regulatory framework of the DFIA in line with the evolving role of DFIs in supporting Malaysia’s socioeconomic development. The new amendments enhance provisions in the DFIA on corporate governance, business activities and the scope of the BNM’s regulatory oversight to ensure sound financial management and an improvement in the operational efficiency and resilience of DFIs. Other amendments incorporate new provisions for the regulation of shariah governance and consumer protection, with enforcement tools to ensure compliance. Under the Acts, all persons undertaking banking business, investment banking or insurance business are required to hold a valid licence granted by the Minister. These businesses continue to fall within the oversight of the Ministry of Finance and the BNM. The Minister is the authority for the issuance, revocation or imposition of conditions of licences to carry on banking business, insurance business and investment banking business, and has the power to carry out investigations in certain circumstances. Specifically, licences for commercial and investment banks are issued under the FSA, whereas licences for Islamic banks and international Islamic banks are issued under the IFSA. The CMSA provides that any person wishing to carry out capital market activities (save for registered persons) is required to be licensed by the SC, the sole authority that issues and approves licences for capital market intermediaries engaging in the regulated activities prescribed under the CMSA. Under the CMSA single licensing regime, capital market intermediaries that are fit and proper are issued with a licence that will enable them to carry on one or more regulated activities. such other business as the Labuan FSA, with the approval of the Minister, may specify, in any currency (including ringgit where permitted by the Acts or such other relevant law in force). The LIFSSA also empowers the Labuan FSA to grant licences for the conduct of Labuan Islamic banking business (i.e., the carrying on of Labuan banking business in compliance with shariah principles). From a corporate governance perspective, the Acts codify the duties of the directors of financial institutions and place stringent requirements for transparency on the directors of financial institutions and their holding companies. Directors are required to disclose to the board of directors the nature and extent of any direct or indirect interest in a material transaction or material arrangement with the financial institution where they hold office. Further, under the Acts, the approval of the BNM is required for the appointment, election, reappointment and re-election of the chairperson, directors and chief executive officer of a financial institution. The aforementioned RBS approach18 is primarily implemented by the BNM through the adoption of risk profiles, best practices, sound governance and proper risk management systems within the internal oversight process of each institution with the objective of anticipating and managing future risks; and identifying and resolving weaknesses within the processes of each institution. The BNM further facilitates the RBS approach by ensuring the quality of the membership of directors and senior management of financial institutions, inculcating a culture of workforce risk management and ethics, and reliance on the opinion of independent audit and actuarial professionals appointed by financial institutions. The BNM also has stringent ‘fit and proper’ tests, which are set out in further guidelines contained in the Fit and Proper Criteria of June 201320 issued under the FSA, which should be read together with the Corporate Governance guidelines issued in August 2016 (CG Guidelines).21 The BNM also issued Fit and Proper criteria in June 2017 for the DFIs, as prescribed under the DFIA. The CG Guidelines are applicable to, inter alia, banks, investment banks, Islamic banks and ‘financial holding companies’ (i.e., companies approved by the BNM to hold more than 50 per cent of the shares of a licensed financial institution), and set out the minimum standards of corporate governance which the BNM expects local financial institutions to adopt, which are consistent with the long-term viability of the aforesaid institutions. in the case of Islamic financial institutions, a shariah committee to provide oversight on shariah compliance. In addition, the aim of the CG Guidelines is to ensure that risk-taking activities and business prudence are appropriately balanced so as to maximise shareholders’ returns and protect the interests of all stakeholders, and they contain principles dealing with board matters, management oversight, accountability and audit and transparency. The Acts also provide that a financial institution may only be licensed if its capital funds are equal to or exceed the minimum amount prescribed by the Minister. Pursuant thereto, the BNM issued the Guidelines on Capital Funds and the Guidelines on Capital Funds for Islamic Banks in 2013 to ensure that financial institutions maintain a minimum amount of capital to operate and perform their functions. The Guidelines on Capital Funds provide that the minimum capital funds that must be maintained by commercial banks and investment banks are as follows: for a domestic bank (by itself or in aggregation with its related corporation that is a licensed investment bank), 2 billion ringgit; for a locally incorporated foreign bank, 300 million ringgit; and for a stand-alone investment bank, 500 million ringgit.29 Under the Guidelines on Capital Funds for Islamic Banks, banking entities are required to maintain 300 million ringgit as a minimum capital fund. In December 2010, the Basel Committee on Banking Supervision (Basel Committee) finalised a package of measures to strengthen global capital and liquidity rules with the goal of strengthening the resilience of the global banking system. 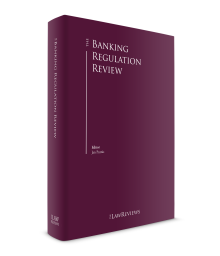 The rules are detailed in the documents Basel III: A global regulatory framework for more resilient banks and banking systems (revised) and Basel III: International framework for liquidity risk measurement, standards and monitoring (collectively, Basel III). In November 2012, the BNM issued its regulatory capital adequacy framework (Capital Adequacy Framework (Capital Components) (2012 Framework)), implementing Basel III reforms. The capital requirements promulgated by the BNM provided that banking institutions were required to maintain the following minimum capital ratios for the calendar years stated: (1) a Common Equity Tier 1 (CET1) capital ratio of 3.5 per cent in 2013, 4 per cent in 2014 and 4.5 per cent in 2015; (2) a Tier 1 capital ratio of 4.5 per cent in 2013, 5.5 per cent in 2014 and 6 per cent in 2015; and (3) a total capital ratio of 8 per cent from 1 January 2013 onwards. The 2012 Framework provided that these capital requirements would be supplemented by a leverage ratio, an LCR and a net stable funding ratio. Further, banking institutions were required to maintain additional capital buffers above the minimum CET1, Tier 1 and total capital ratios set out above in the form of a capital conservation buffer and a countercyclical capital buffer based on a percentage of total risk-weighted assets. The CA was introduced in early 2017, repealing and superseding the Companies Act 1965 for the most part. As with corporations, financial institutions are subject to general legislation for corporate insolvency, now contained within Part IV of the CA. The modes of winding-up proceedings under the CA include compulsory and voluntary winding up and the appointment of receivers and managers over a corporation. The Act also contains provisions relating to corporate voluntary arrangements and judicial management in Part VIII (corporate rescue mechanisms), which came into force on 1 March 2018, together with the Companies (Corporate Rescue Mechanism) Rules 2018. However, specialised frameworks for addressing the failure of financial institutions to pay their debts as they fall due exist separately under the Acts and the Malaysia Deposit Insurance Corporation Act 2011 (MDICA). Consumers who make deposits into financial institutions in Malaysia are protected by an insurance scheme known as the Perbadanan Insurans Deposit Malaysia (PIDM) (or the Malaysia Deposit Insurance Corporation (Corporation)) pursuant to the provisions of the MDICA. As a measure that promotes financial stability within the financial system, the PIDM ensures that depositors are insured against the loss of their deposits (subject to a threshold of 250,000 ringgit per depositor per financial institution) in the event of loss caused by the failure of the financial institution holding their deposits. The provisions of the MDICA empower the Corporation to assume control of a non-viable financial institution, and to acquire and take control of non-performing loans that are outstanding between financial institutions, borrowers and security providers through the appointment of a conservator. such other activities as the BNM, with the approval of the Minister, may prescribe. The LFSSA and the LIFSSA provide that the Labuan FSA may grant a Labuan banking licence, a Labuan investment banking licence, a Labuan Islamic banking licence, a Labuan Islamic investment banking licence or such business as the Labuan FSA, with the approval of the Minister, may specify. Labuan banks holding any of the aforementioned licences would only be allowed to undertake business activities in currencies other than Malaysian ringgit in, from or through the Labuan IBFC, subject always to the relevant exchange control restrictions imposed under the Acts. preventing collusive business practices that may result in unfavourable outcomes to financial consumers. In addition to the foregoing, the Financial Services (Financial Ombudsman Scheme) Regulations 2015 and Islamic Financial Services (Financial Ombudsman Scheme) Regulations 2015 (Regulations) were issued in September 2015. The Regulations established the Financial Ombudsman Scheme (FOS) as contemplated under the FSB to ensure the effective and fair handling of complaints and resolution of disputes against member banking institutions for direct financial loss, within prescribed monetary limits, which include 250,000 ringgit in respect of disputes relating to financial service, and 25,000 ringgit for disputes on unauthorised transactions involving payment instruments, payment channels or cheques. As the responsible authority under the Malaysian Anti-Money Laundering, Anti-Terrorism Financing and Proceeds of Unlawful Activities Act 2001, the BNM is tasked with disseminating financial intelligence received from reporting entities to the law enforcement agencies tasked to investigate money laundering and terrorism financing activities. The Anti-Money Laundering and Counter Financing of Terrorism (AML/CFT) – Banking and Deposit-Taking Institutions (Sector 1) Guidelines also state the obligations of reporting institutions and common red flags with respect to the banking sector. The BNM has continuously sought to strengthen money laundering and terrorism financing controls and practices among banking institutions. This is reflected in the increased resources allocated to, and investments in, screening and transaction monitoring systems, and improved practices in the conduct of customer due diligence. Further enhancements in governance and control measures were put in place to improve processes for identifying transactions designed to evade tax and for assessing risks associated with politically exposed persons. The SC has also been active in undertaking regulatory reform, and introduced the Lodge and Launch (LOLA) Framework for wholesale offerings of unlisted capital market products in June 2015, which constituted a major revision of its capital markets product authorisation rules. The LOLA provides an avenue for unlisted capital market products offered to sophisticated investors (comprising accredited investors, high net worth entities and high net worth individuals) to be made available to such investors once specific information has been lodged with the SC via an online submission system, which significantly reduces the time to market. The Netting of Financial Agreements Act 2015 (NFAA), which came into force in March 2015, contains provisions for the enforceability of close-out netting for financial transactions in Malaysia. Close-out netting is an important risk-management mechanism used by financial institutions and other financial market participants in financial derivative transactions and repurchase transactions. The enforceability of close-out netting provides credit risk reduction and mitigation benefits by allowing counterparties to net off credit risk exposures instead of having gross exposures, thus improving operational efficiency and reducing systemic risk of the financial system. In 2016, the BNM introduced the Financial Technology Regulatory Sandbox Framework (Framework) to enable the deployment and testing of innovations and advances in financial technology (fintech) in live environments within specified parameters and time frames. The Framework sets out a conducive regulatory environment that harnesses the potential of fintech to modernise, deepen and inject competition in the domestic financial and funding markets. Through the Framework, the BNM aims to facilitate the growth and development of Malaysia’s financial sector by encouraging innovation in financial services and the introduction of new business models, solutions and enhancements in customer value and experience; and improvements in the efficiency and risk management of financial institutions.51 The Financial Technology Enabler Group (FTEG) was established by the BNM in June 2016. It is responsible for formulating and enhancing regulatory policies to facilitate the adoption of technological innovations in the Malaysian financial services industry. In 2017, the BNM spearheaded a tripartite effort between the Malaysian Anti-Corruption Commission and the Inland Revenue Board of Malaysia for strategic cooperation in combating financial crimes, tax evasion and corruption. This joint strategic cooperation aims to combine the powers and resources of each agency to restrain financial crimes, especially those involving corruption and tax evasion. It is hoped that this joint effort will strengthen the country’s financial system, increase national revenue, and build a nation free from corruption and abuse of power. The Acts provide that all approvals are required on two levels: first, prior to commencement of negotiations, and subsequently, prior to the execution of the relevant transaction agreements. Approval is required for direct and indirect acquisitions of shares in a financial institution. The Acts require the approval of the BNM or the Minister for the acquisition of interest in shares that exceed prescribed percentages, or result in a change in control, of a financial institution. An ‘interest in shares’ is defined under Schedule 3 of the Acts, and includes both legal and beneficial interest in shares. Such an interest arises when a person enters into a contract to acquire shares or has a right to have a share transferred to them. A person is deemed to have an interest in shares if they hold shares jointly with another person. This does not apply in certain instances, such as when the interest is held by a person as security or as bare trustee. entering into any agreement that will result in him or her holding an aggregate of more than 50 per cent of the interest in shares of a financial institution. A person’s interests are aggregated with shares held by his or her spouse, children, family corporation and persons acting in concert with him or her for the purposes of determining interests held, or to be held, by a person in a financial institution. The Acts require a person to obtain the prior approval of the Minister if he or she takes control of a financial institution. In this case, ‘control’ means the acquirer has an interest of more than 50 per cent of the shares in a financial institution; or, unless proven otherwise, has the power to, inter alia, appoint the majority of the directors of a financial institution, or to make and implement business and administration decisions of a financial institution, or is a person in accordance with whose directions, instructions or wishes the directors or senior officers of a financial institution are accustomed or under an obligation to so act. The Acts also require a person who has an aggregate interest in shares of a financial institution of more than 50 per cent, or 50 per cent or less but has control over the financial institution, to obtain the approval of the Minister before entering into an agreement that would result in that person holding less than a 50 per cent interest in shares in, or ceasing to have control over, the licensed person. The Acts stipulate that an individual may own a maximum interest of 10 per cent of the shares in a financial institution. However, solely in the case of the IFSA, this threshold may be waived by the BNM if it is satisfied that an individual will not exercise control over the financial institution and has given a written undertaking not to exercise control over the financial institution. No such provision for waiver is provided for under the FSA. The Acts require the prior approval of the Minister, upon recommendation by the BNM, for any agreement or arrangement for the reconstruction or amalgamation of a financial institution. The Acts also require the prior written approval of the BNM for any agreement or arrangement to transfer the whole or part of the business of a financial institution. Consequently, the prior approval of the Minister or the BNM (as the case may be) would have to be applied for and obtained if the acquisition of a financial institution is to take place through the acquisition of business and assets. up to 30 per cent in conventional commercial banks. Priority will be accorded to investors who have the capacity to contribute in areas of Malaysia’s financial sector where growth is required and in new areas of growth, or in areas that will reinforce Malaysia’s position as an international Islamic financial hub. requiring exporters to convert 75 per cent of their proceeds into ringgit. On 18 February 2018, the BNM issued the Anti-Money Laundering and Counter Financing of Terrorism Policy for Digital Currencies (Sector 6) (Policy Document) to ensure that effective measures are in place against money laundering and terrorism financing risks associated with the use of digital currencies and to increase the transparency of digital currency activities in Malaysia.64 However, it is to be noted that, as provided in the Policy Document, digital exchanges are presently neither licensed nor authorised by the BNM, which effectively means the absence of an established avenue for redress in the event of disputes or losses incurred in digital currency transactions. Further to the foregoing, the BNM established the FMC in May 2016,65 which was entrusted with formulating strategies to further develop the domestic financial market and provide an effective engagement platform to discuss potential issues and risks related to the development of the financial market. Since its inception, proactive measures have been introduced to develop the onshore foreign exchange market, mitigate speculative activities and correct imbalances that existed within the onshore foreign exchange market. The FMC issued ‘Updates on Malaysian Financial Market’ on 21 December 2017, on the results of the FMC’s various initiatives. In conclusion, Malaysia has a strong financial system that is the result of many decades of good work and systematic development. The strength of the BNM’s institutional arrangements has been tested and has always been proven in times of change and uncertainty. Although fundamental shifts in political and social dynamics have made the regulatory and policymaking environment increasingly challenging, we firmly believe that Malaysia will maintain its role at the forefront of banking and financial regulation, and continue its outstanding work towards a better future for all Malaysians. 1 Rodney Gerard D’Cruz is a partner at Adnan Sundra & Low. 2 Bank Negara Annual Report (Executive Summary) 2017 (BNM Executive Summary) (www.bnm.gov.my/files/publication/ar/en/2017/cp00_004_exec_summary.pdf. 3 Gross Domestic Product Fourth Quarter 2017, Department of Statistics Malaysia (https://www.dosm.gov.my/v1/index.php?r=column/cthemeByCat&cat=100&bul_id=emUyMzI4eElNK0hZQzRyaEgyZGhlZz09&menu_id=TE5CRUZCblh4ZTZMODZIbmk2aWRRQT09). 4 BNM Executive Summary (see footnote 2). 8 Securities Commission Malaysia, Annual Report 2017 (https://www.sc.com.my/wp-content/uploads/eng/html/resources/annual/ar2017_eng/scar2017_eng.pdf). 9 Pemandu website: etp.pemandu.gov.my. BNM website: www.bnm.gov.my/?ch=en_fsd&pg=en_fsd.intro&ac=737. 12 FSA; IFSA, Section 12. 13 Labuan IBFC website: www.labuanibtc.com. 14 BNM Financial Stability and Payment Systems Report 2017 (www.bnm.gov.my/files/publication/fsps/en/2017/fs2017_book.pdf). 15 BNM Financial Stability and Payment Systems Report 2016 (www.bnm.gov.my/files/publication/fsps/en/2016/fs2016_book.pdf). 16 SC website: www.sc.com.my/the-licensing--process. See also Section 58, CMSA. 17 Section 55, FSA; Section 69, IFSA. 20 Guidelines on Fit and Proper Criteria dated 28 June 2013 (www.bnm.gov.my/guidelines/01_banking/04.../Ft_Proper_Criteria_280613.pdf). 21 Guidelines on Corporate Governance (https://www.bnm.gov.my/index.php?ch=57&pg=140&ac=512&bb=file). 23 Guidelines on Corporate Governance 2016 (https://www.bnm.gov.my/index.php?ch=57&pg=140&ac=512&bb=file). 24 BNM Liquidity Coverage Ratio Framework, 31 March 2015 (www.bnm.gov.my/guidelines/01_banking/ 04_prudential_stds/Liquidity_Coverage_Ratio.pdf). 25 Statutory Reserve Requirement Guidelines dated 26 January 2016 (https://www.bnm.gov.my/index.php?ch=57&pg=137&ac=30&bb=file). 26 CBA Section 26; BNM Statutory Reserve Guidelines 2016 (https://www.bnm.gov.my/index.php?ch=57&pg=137&ac=30&bb=file). 27 Removal of reserve fund requirement in the policy document on Capital Funds (www.bnm.gov.my/index.php?ch=en_announcement&pg=en_announcement&ac=534&lang=en). 28 Removal of reserve fund rule mildly positive for banks (www.theedgemarkets.com/article/removal-reserve- fund-rule-mildly-positive-banks). 29 BNM’s Capital Funds Guidelines 2013 (www.bnm.gov.my/guidelines/01_banking/04_prudential_stds/gl_001_8_Capital%20Funds_RSA_01072013.pdf). 30 Implementation of Basel III (2010) (www.bnm.gov.my/guidelines/01_banking/01_capital_adequacy/ 12_nt_007_25.pdf). 31 Basel III Observation Period Reporting (Capital Adequacy Ratios, Liquidity Coverage Ratio, and Leverage Ratio) 2017 (www.bnm.gov.my/index.php?ch=57&pg=140&ac=669&bb=file). 32 Capital Adequacy Framework (Capital Components) 2012 and 2015 (www.bnm.gov.my/guidelines/ 01_banking/01_capital_adequacy/gl_11_capital_adequacy_framework.pdf) (www.bnm.gov.my/guidelines/ 01_banking/01_capital_adequacy/Capital_Adequacy_Framework_Capital%20Components_Oct2015.pdf). 33 Reissuance of the Capital Adequacy Framework (Capital Components) 2017, Capital Adequacy Framework (Capital Components) 2017 (www.bnm.gov.my/index.php?ch=en_announcement&pg=en_announcement &ac=567&lang=en). 34 Capital Adequacy Framework (Capital Components) 2018 (www.bnm.gov.my/index.php?ch=57&pg=137&ac=447&bb=file). 35 BNM Financial Stability and Payment Systems Report 2017 (www.bnm.gov.my/files/publication/fsps/en/2017/fs2017_book.pdf). 37 Sections 161 and 179, MDICA. 38 Sections 98 and 99, MDICA. 39 Sections 165 and 167, FSA; Sections 177 and 179, IFSA. 44 Sections 204, 205, 207, IFSA. 45 Section 205, FSA; Section 216, IFSA. 46 Guidelines on International Islamic Banks 2008 (https://www.bnm.gov.my/index.php?ch=57&pg=137&ac=54&bb=file). 47 BNM Financial Stability and Payment Systems Report 2016 (www.bnm.gov.my/files/publication/fsps/en/2016/fs2016_book.pdf). 48 Financial Services (Financial Ombudsman Scheme) Regulations 2015 and Islamic Financial Services (Financial Ombudsman Scheme) Regulations 2015 (www.bnm.gov.my/index.php?ch=57&pg=137&ac= 443&bb=file) (www.bnm.gov.my/index.php?ch=57&pg=137&ac=444&bb=file). 49 BNM Financial Stability and Payment Systems Report 2017 (www.bnm.gov.my/files/publication/fsps/en/2017/fs2017_book.pdf). 50 Malaysia Ministry of Finance press release dated 30 March 2015 (www.treasury.gov.my/index.php/en/archives/2015/speech/item/961-press-release-coming-into-force-of-the-netting-of-financial-agreements-act-2015.html). 51 Financial Technology Regulatory Sandbox Framework (www.bnm.gov.my/index.php?ch=en_press&pg=en_press&ac=4273&lang=en). 52 Repurchase Agreement Transactions (www.bnm.gov.my/index.php?ch=en_announcement&pg=en_announcement&ac=436&lang=en). 53 BNM Financial Stability and Payment Systems Report 2017 (see footnote 49). 54 FAQs of the Companies Act 2016 (Act 777) (www.ssm.com.my/sites/default/files/companies_act_2016/companies_act_2016_-_policies.pdf). 55 Bank Negara Annual Report (Executive Summary) 2017 (www.bnm.gov.my/files/publication/fsps/en/2017/fs2017_book.pdf). 56 Trans-Pacific Partnership Agreement (TPP) and Comprehensive and Progressive Agreement for Trans-Pacific Partnership (CPTPP) (http://fta.miti.gov.my/index.php/pages/view/71?mid=40). 59 Corporate Governance 2016 (https://www.bnm.gov.my/index.php?ch=57&pg=140&ac=512&bb=file). 61 Supplementary Notice on Foreign Exchange Administration Rules – Measures to Promote The Development of Malaysian Financial Market (www.bnm.gov.my/documents/2016/Supplementary_Notice_on_Foreign_Exchange_Administration_Rules.pdf). 62 BNM press release dated 6 December 2016 (www.bnm.gov.my/index.php?ch=en_press&pg=en_press&ac=4318). 63 Supplementary Notice (No. 2) on Foreign Exchange Administration Rules and Amendment to the Definitions of the Notices on Foreign Exchange Administration Rules – Measures to Promote Development of Malaysian Financial Market (www.bnm.gov.my/index.php?ch=en_announcement&pg=en_announcement&ac=533&lang=en). 64 Bank Negara Malaysia issues policy document for digital currencies (see also footnote 45) (www.bnm.gov.my/index.php?ch=en_press&pg=en_press&ac=4628&lang=en). 65 Establishment of the Financial Markets Committee (see also footnote 6) (www.bnm.gov.my/index.php?ch=en_press&pg=en_press&ac=4178&lang=en).